Elastic Beanstalk provides integration with Amazon Relational Database Service (Amazon RDS) to help you add a database instance to your Elastic Beanstalk environment. You can use Elastic Beanstalk to add a MySQL, PostgreSQL, Oracle, or SQL Server database to your environment during or after environment creation. When you add a database instance to your environment, Elastic Beanstalk provides connection information to your application by setting environment properties for the database hostname, port, user name, password, and database name. A database instance that is part of your environment is tied to the lifecycle of your environment. You can't remove it from your environment once added. If you terminate the environment, the database instance is terminated as well. 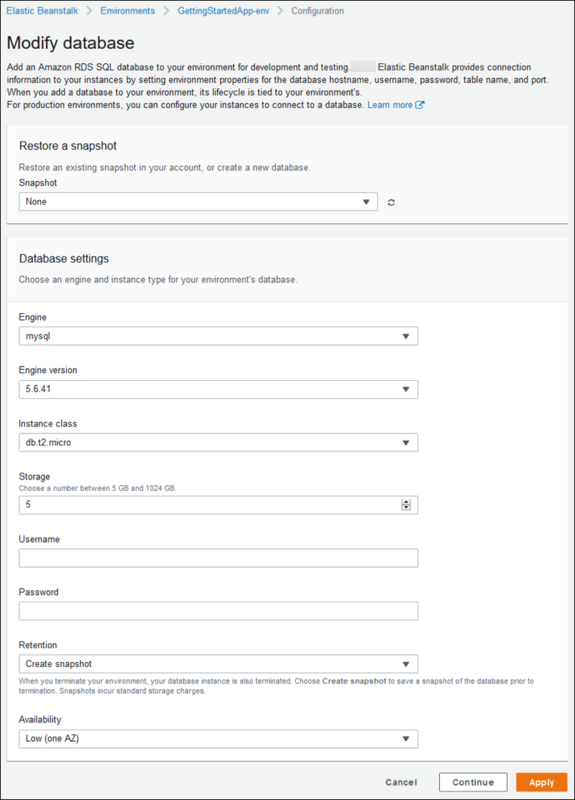 You can configure Elastic Beanstalk to save a snapshot of the database when you terminate your environment, and restore a database from a snapshot when you add a DB instance to an environment. You might incur charges for storing database snapshots. For more information, see the Backup Storage section of Amazon RDS Pricing. For a production environment, you can launch a database instance outside of your environment and configure your application to connect to it outside of the functionality provided by Elastic Beanstalk. Using a database instance that is external to your environment requires additional security group and connection string configuration. However, it also lets you connect to the database from multiple environments, use database types not supported with integrated databases, perform blue/green deployments, and tear down your environment without affecting the database instance. You can add a DB instance to your environment by using the Elastic Beanstalk console. Engine – Choose a database engine. Engine version – Choose a specific version of the database engine. Instance class – Choose the DB instance class. For information about the DB instance classes, see http://www.amazonaws.cn/rds/. Storage – Choose the amount of storage to provision for your database. You can increase allocated storage later, but you cannot decrease it. For information about storage allocation, see Features. Username – Type a user name of your choice using alphanumeric characters. Password – Type a password of your choice containing 8–16 printable ASCII characters (excluding /, \, and @). Retention – Choose Create snapshot to create a snapshot of the database when you terminate your environment. Availability – Choose High (Multi-AZ) to run a warm backup in a second Availability Zone for high availability. Elastic Beanstalk creates a master user for the database using the user name and password you provide. To learn more about the master user and its privileges, see Master User Account Privileges. Use the connectivity information to connect to your DB from inside your application through environment variables. For more information about using Amazon RDS with your applications, see the following topics. You can view and modify configuration settings for your DB instance in the Database section on the environment's Configuration page in the Elastic Beanstalk console. You can modify the Instance class, Storage, Password, Retention, and Availability settings after database creation. If you change the instance class, Elastic Beanstalk re-provisions the DB instance. Don't modify settings on the DB instance outside of the functionality provided by Elastic Beanstalk (for example, in the Amazon RDS console). If you do, your Amazon RDS DB configuration might be out of sync with your environment's definition. When you update or restart your environment, the settings specified in the environment override any settings you made outside of Elastic Beanstalk. If you need to modify settings that Elastic Beanstalk doesn't directly support, use Elastic Beanstalk configuration files. You can configure your environment's DB instance using configuration files. Use the options in the aws:rds:dbinstance namespace. The following example modifies the allocated database storage size to 100 GB. If you need to configure DB instance properties that Elastic Beanstalk doesn't support, you can still use a configuration file, and specify your settings using the resources key. The following example sets values to the StorageType and Iops Amazon RDS properties.